Which, despite there being no equivalent translation into English, means a mixture of wonderful, poetic, peaceful, calm, relaxed, at one with the universe, infinite, free, loving, meditative. There is something about being in old woodlands on one’s own – the atmosphere of which can be calm and magical in the well-lit hours - or be beguiling and numinous in the fading light of the end of the day, with a desire to be well out of the woods by the end of twilight. "Among all the varied productions with which Nature has adorned the surface of the earth, none awakens our sympathies, or interests our imagination so powerfully as those venerable tees which seem to have stood the lapse of ages, silent witnesses of successive generations of man, to whose destiny they bear so touching a resemblance, alike in their budding, their prime and their decay." 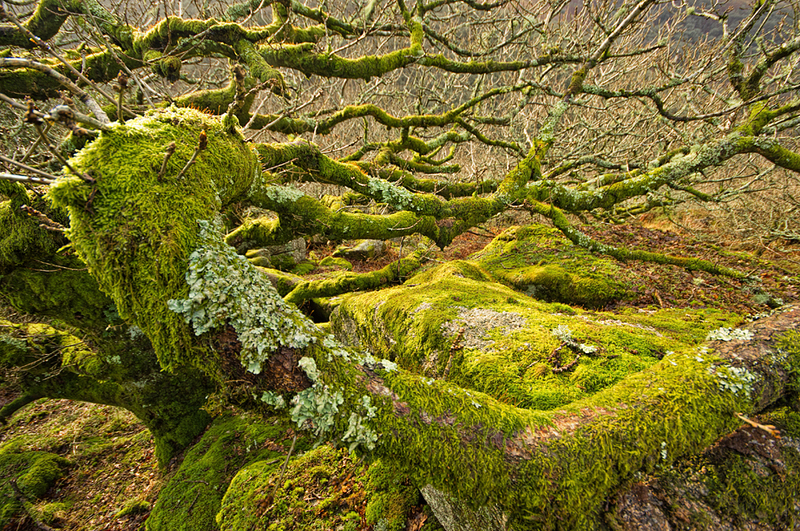 Wistman’s Wood – especially when the evening breezes cause a stir amongst the stunted and ancient high-moorland oaks, rowan, holly, ferns, lichens and willow that grow amongst the granite boulders. It lies at an altitude of between 380–420 metres in the valley of the West Dart River near Two Bridges, at grid reference SX613770. The wood has been a Site of Special Scientific Interest since 1964, and is a Nature Conservation Review site. It has the classification of being a temperate rainforest - due to it's mild, moist microclimate. A diverse collection of 164 species of epiphytic lichens & mosses shroud the trres and rocks. Beware of adders if you visit, who famously love this woodland's nooks and crannies - so make sure you have walking boots or wellies on! It is quite probable that the name of this wood derives from Wisht-man's wood, the vernacular word wisht meaning eerie or haunted. In Devon, the Wild Hunt is said to be that of hellhounds chasing sinners, the unbaptized or those lost on the moors after dark. The dogs in the Devonshire dialect are known as wisht hounds. 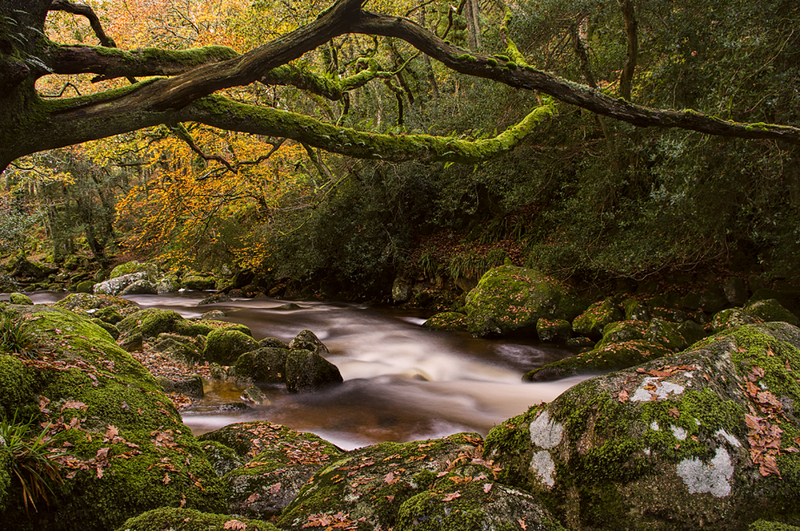 This legendary hunt is particularly associated with Wistman's Wood and tales speak of the end of the hunt being at the Dewerstone where they unfortunate souls are driven off the top of the rock into the raging waters of the River Plym below. The Dewer is the Devonshire name for the Devil himself. Dewerstone Rocks (above this wood, through which runs the River Plym) is huge crag is named after Dewer, the dreaded 'Wisht Huntsman' who in other guises is none other than Satan. Not only does Dewer terrorise the moor at night as he hunts with his dreaded pack of phantom hounds but he haunts the lofty heights of The Dewerstone. Appearing as a tall figure dressed in satanic black he would lure or chase poor unsuspecting travellers to the highest crag and then disappear leaving them to fall to their deaths straight into the waiting jaws of his spectral hounds below. 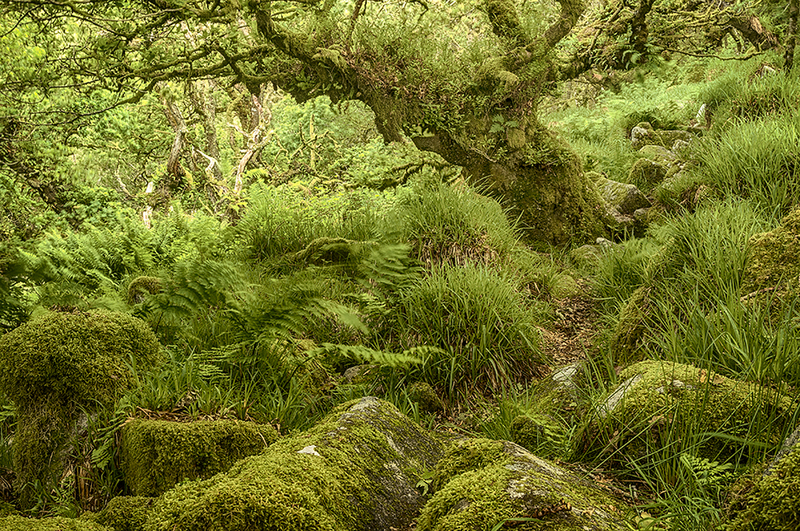 The Dewerstone Woods are near Shaugh Prior in Dartmoor National Park in Devon. Autumn dusk...seconds after making this image below and in the knowledge that I was the only person left in this part of the wood, I saw a blurry black animal of some size racing along the hillside on the far bank... a deer, I hoped... or maybe, just maybe one of the wild cats that are said to be roaming the moors? Needless to say, despite being on the trackless side of the woods and hopping over fallen trees, I made a hasty retreat back to my car! There have been numerous puma sightings reported over the years and Dartmoor Zoo staff have taken casts of footprints out there on the moor of a 'puma-like' big cat back in 1997, when Police marksmen were out on a hunt for some time around Cornwood on one day that year after several independent sightings locally... Hang on a minute Cornwood?!? Well, in 2016 a Lynx that escaped from Dartmoor Zoo for a few days, was wandering around these parts of Dartmoor! Just outside Cornwood are the beguiling Dendle's and Fernfire Woods Site of Special Scientific Interest - and are a brilliant place for a puma or other wild cat to hide, when being chased by Police from Cornwood! It has been a place that I was very grateful to gain an Access permit, for which to explore! 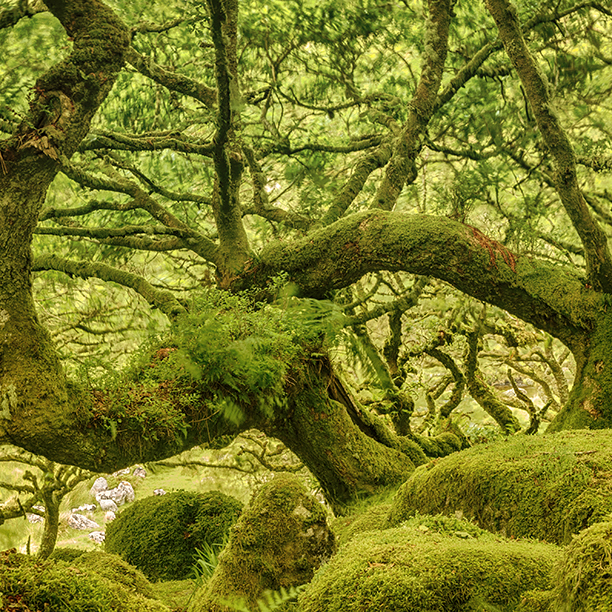 An ancient woodland of oaks and beeches in Dartmoor National Park. "Wer mit alten Bäumen zu sprechen, ihnen zuzuhören weiß, der erfährt die Wahrheit." A gnarled sessile oak (Quercus petraea) in the dense Meltor Wood, in the Dart valley below Mel Tor. It's moss carpeted branches catching some transient morning light between heavy downpours of sleet, rain and hail on a winter's morning. A beguiling ancient atmosphere to this steep woodland. The low hum of the swollen river drifted up from far below. Brilliant stuff Phil - great combination of words and images. 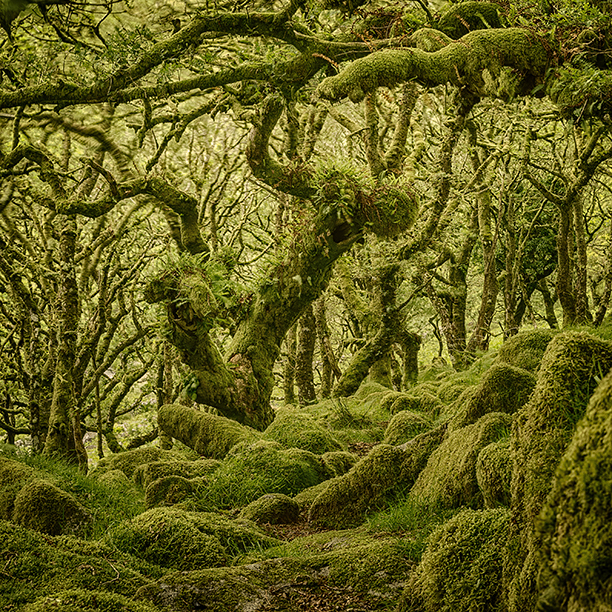 First pic of Wistman reminds me of the interior of a lung (which is what I guess, forests are really!) Interesting to learn about the Dewer too. I agree - those Germans do the whole haunted forest thing really well! Glad you liked the portrait photos of your Troubadour alter-ego 'Don Judah Abrabanel - the dappled light seemed to fit the theme. Wish you the best of luck with your Old Occitan lyric poetry performances in Bristaol and Totnes. Dappled light is also one of the many things I enjoy in woodland photography for sure... more on this in a future blog article!